This entry was posted in Aruba Networks HPE, Switch on August 23, 2016 by aek82. 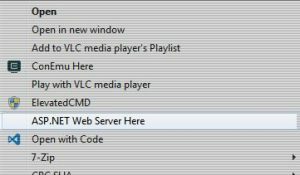 You can download here the updated registry entry for opening the ASP.NET Development Web Server using context menu in Explorer. The path has been updated to use Visual Studio 2015’s development web server. I have not tested this in Windows 10. This entry was posted in ASP.NET, Setting up Applications, Windows 7 on July 20, 2016 by aek82. When setting up the guest network between an IAP with ClearPass, the older guides direct the user to setup a PreAuth role for guest and deny all traffic. It’s assumed a firewall exception or something similar is automatically put into the IAP firewall rules to let the IAP, client, and the ClearPass server communicate, but this isn’t the case currently. In addition to denying traffic to all servers, you need to add additional rules to let the client communicate with ClearPass AND the IAP – or else radius requests will fail. This entry was posted in Aruba Networks HPE on March 22, 2016 by aek82. This entry was posted in Linux on March 21, 2016 by aek82. This runs the shell script every 2 hours. This was created using a this crontab generator. Generating a SSH key for passwordless SSH login and exporting it remotely is explained here. Configure email server so mail command works. Google’s Protobuf code generator uses an API that many .NET developers may find a bit different than the usual MO. An alternative to Google’s Protobuf implementation is Marc Gravell’s protobuf-net library, which uses an implementation that may make more sense to .NET developers. However, the code generator for this library is nowhere to be found in the nuget package. You can download it here. This entry was posted in MS .NET on March 13, 2016 by aek82. Marc Gravell has an online tool for generating C# code from a .proto file. This entry was posted in MS .NET, Setting up Applications on March 11, 2016 by aek82. This entry was posted in Linux on March 11, 2016 by aek82. This entry was posted in Uncategorized on January 10, 2016 by aek82. First find the drive mounting point, usually located in /dev. In this example, /dev/sdd is the new disk. This entry was posted in Linux, Setting up Applications on January 10, 2016 by aek82.